Sony is widely credited as being the first into the ebook reader market when they launched the Sony Data Discman in 1990, but they weren't the only ones working on a prototype. 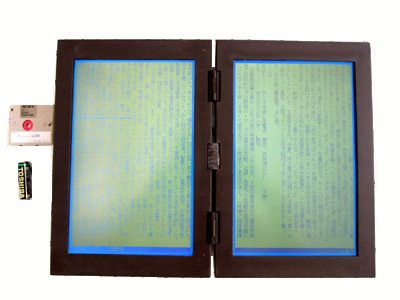 I've just found a new video on Youtube which looks at a prototype dual-screen ereader from 1989. It was never produced, and I doubt that it was ever a viable product, but it is still a cool-looking device. The Electronic Book Unit 1 used 2 monochrome LCD displays. Powered by 6 AA batteries, this ebook reader weighed in at an impressive 2.7 kg. It measured 28 cm by 19 cm by 5 cm, making it thicker and nearly as large as my laptop. I actually can't add much more than what I wrote above due to the video. It's narrated in text in Japanese, which means I cannot use Google translate to get more information. The video is also less a video than a montage of photos from 1989, but it still shows enough detail that it's worth watching. The video is an excellent reminder that the idea for ebook readers has been around for far longer than the past decade. Sure, the Kindle ignited the market in 2007, but the idea had been kicking around for at least a couple decades, waiting for technology to catch up.